Part 1 The big picture: Why bother to catalogue? What to catalogue? Who should catalogue? How to catalogue … and not reinvent the wheel. Part 2 The nitty-gritty: Is it a book, is it a journal? What’s a strange attractor? Cataloguing subjects you know nothing about; Ici on ne lit pas le français: unknown languages and how to deal with them; Special cases; Resources for cataloguers. This book is an introduction, ‘handy’ and authoritative guide to the principles of cataloguing for librarians, information scientists and information managers. It is intended to be used in conjunction with an internationally recognised standard to show how, firstly, cataloguing underpins all the other activities of an information service and, secondly, how to apply best practice in a variety of different situations. 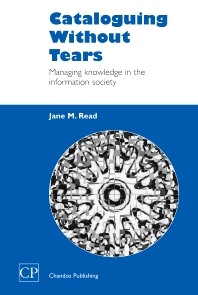 Jane Read has over 13 years experience in academic libraries. She currently works as cataloguing officer at The Higher Education Academy.